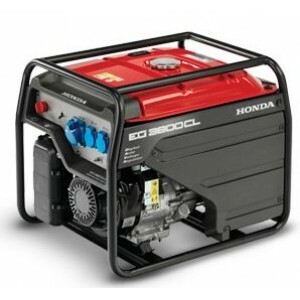 Honda generators most popular model is the EU 20i closely followed by its smaller sister the Honda EU 10i, in combination the most reliable inverter generators in the world. 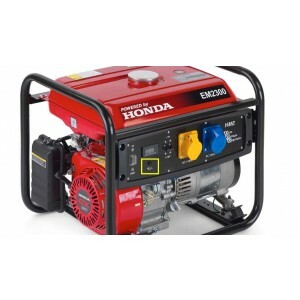 Honda generators most popular model is the Honda EU 20i closely followed by its smaller sister the Honda EU 10i, in combination the most reliable inverter generators in the world. Generator Warehouse is an authorised dealer for Honda power equipment and together with its business partner YorPower, delivers all its generators direct to your door fully tested and ready to go at a convenient time for you, so you don't have to worry. 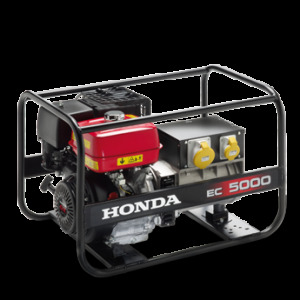 For extra peace of mind, Honda generators carry a 5 Year warranty underpinning Hondas' confidence and commitment to quality, reliability and endurance. 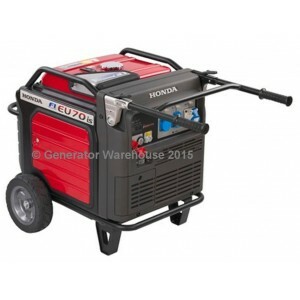 Generator Warehouse holds the full range of Honda generator products including the recently launched EU70iS and we keep large stocks of all the most popular models, delivers 7 days a week throughout the UK. Honda generators, better by design from Generator Warehouse. 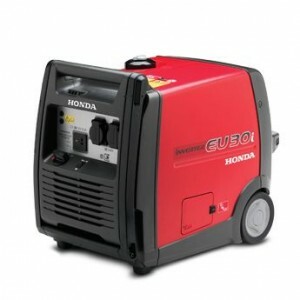 Since the launch of the first ever portable Honda generator, the E300 in January 1965, right up to the launch of the EG range in June 2010, Honda has been at the forefront of optimising performance. No other company has the same pedigree or capability to design small power products that have mass market appeal which deliver such reliable power when you need it. Honda generators save you time to do the things you want to do. 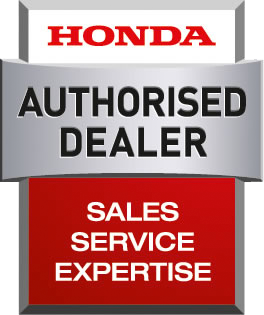 As a Honda Generators Authorised Dealer we are trained to care the Honda way. Extensive training programmes and regular refresher courses enable Honda to keep us right up to date with new products, service regimes and support. That's why you can rely on our advice and product knowledge to help you choose what's right for you. Reassurance is guaranteed. The Honda generator 4-stroke engine provides cleaner exhaust gas and reduces emissions, delivers better fuel economy and keeps noise levels to a minimum. This same technology innovation can be found in everything from Honda powered cars to powerboat engines as well as in Honda generators. Save fuel, save time, save money, help the environment. 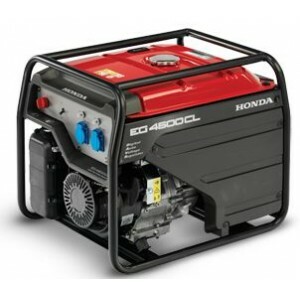 Honda generators reputation for ruggedness and durability is supported by a 5 year warranty (subject to an annual service) for domestic use and 1 year for professional use, covering parts and labour. No other company provides such reassurance or has the same level of confidence in its products. 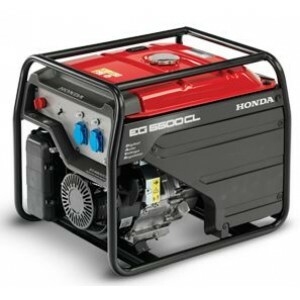 Honda generators give you peace of mind. Honda's determination to design products that enhance and widen the choice of how people live their lives goes well beyond motorcars and motorbikes. As far back as 1953, Honda used to assemble over 100 million power products which were distributed on a worldwide scale even then. And, it was a Honda engineer who put forward the argument for the small 4 stroke engine. For many years, people assumed that only 2-stroke engines could be used for compact power products which were noisy and awkward to maintain. The world's number 1 engine manufacturer pondered… "why couldn't’ 4-stroke technology work for compact products as well as for larger applications?" 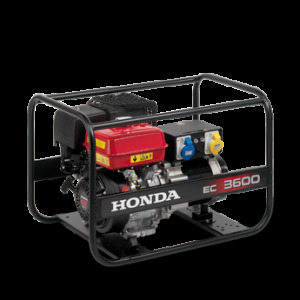 Of course it could and continues to be the engine of choice today - Honda is a leader in the development of low-emission, fuel efficient, environmentally friendly 4-stroke engines for use in generators, water pumps, lawn mowers and many other power equipment applications. 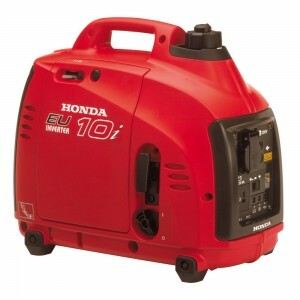 (i) Honda Inverter Generators EU10 – EU65. 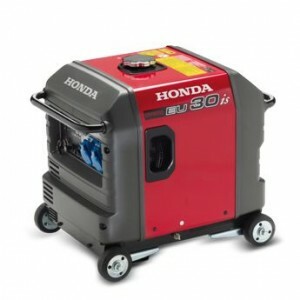 The Honda inverter generator range primarily caters for the leisure end of the market ideal for powering caravan accessories, mobile catering where noise is an issue and canal boats, albeit, the EU30 and EU65 models are capable of operating professional/commercial applications if required. Sizes start at 1000 watts and top out at 6500 watts. Note the ratings stated are ‘maximum output’ load and not the optimum running loads, please refer to ‘rated output’ for optimum running load. Inverter generators reduce fuel consumption significantly because they respond immediately to a drop in load (if you turn off some equipment) by reducing engine revs, consequently fuel economy improves as less is used. Conventional generators run at a constant speed regardless of load, typically at 1500 or 3000rpm. 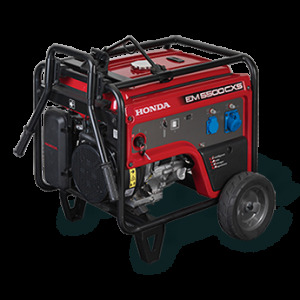 Honda Inverter generators also deliver very accurate and stable voltage output which means that if you are powering sensitive equipment such as TV’s, PC’s, or LAPTOP’s you will get minimal if any interruption or distortion. Inverter technology and the process involved in ensuring the output is stable comes at a price, hence why they are more expensive than a conventional frame style generator. In short the primary pluses and minuses are listed below. 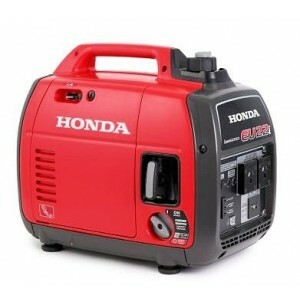 The Honda frame generator range can be used by the home DIY enthusiast, but its primary target market is the Tradesman who needs a supply of constant reliable power when mains is not available. That said, if long enough extension lead(s) are used, Honda frame generators can be used in domestic environments, where voltage movement does not matter. Voltage variation for power tools and noise levels that fluctuate on a commercial building site are not of such great concern and so the trade-off is a much cheaper product, which can deliver a continuous source of power more economically in terms of capital outlay.